Sometimes you just gotta work with what you got. I had ground beef, and my Beloved suggested chili. Chili. Good. Except I didn’t have diced tomatoes. And the only beans I had were Great Northern, which would have worked but we like black-eyed peas in our chili. At quick look at Google revealed a concept for Frito Pie, and a little digging revealed a Frito Pie recipe using salsa verde instead of tomatoes. I didn’t have Fritos either. But I had Takis! Besides salsa verde, the recipe called for canned green chilis. Yup. Fresh out of those, too. But I had a half a sweet red pepper. How ’bout that? Well, a little bit of simmering coordinated all my flavors. Green Takis Pie with ground beef and Great Northern beans was even better topped with the very sharp cheddar cheese I found in the back of the cheese drawer (no mold, thank you very much) and dollops of cool sour cream. We had lots of sour cream. From inconsiderable beginnings come impressive results. 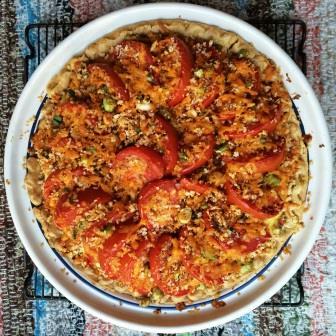 Today’s celebration of summer’s bounty: Tomato and Corn Custard Pie. Rarely do I attempt Martha Stewart’s creations in her Living magazine, but sometimes I try what Food Network magazine is dishing. Notwithstanding the blender spew of hot, creamy corn, tonight’s dinner depending on a harvest of autumn veggies (and a little cheese) was a rousing success. I was pleased my version looked quite similar to the magazine’s picture, which made my mouth water. 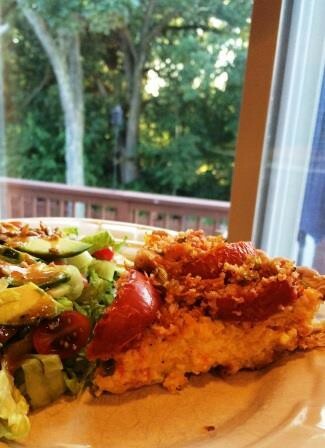 Real men do indeed eat quiche; my Beloved had two slices. This tomato sauce is the best EVER! Of course, it begins with fresh ingredients — I picked the cherry tomatoes and peppers this afternoon — but I’m a sucker for using the blender. 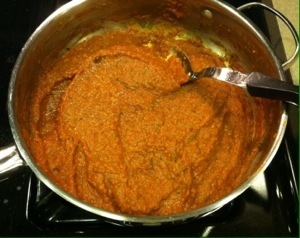 My version blends the tomato seeds and skins right into the sauce — more texture for the cook, I say. Here’s how: Roast a cookie sheet of whole cherry tomatoes, five small peppers (deseeded), two carrots (cut into sticks), half a red onion and a couple garlic cloves at 400 degrees for 40 minutes. Season with a generous amount of grape seed oil, salt and pepper. Allow to cool 5 minutes, then scrape the whole mess into a blender. Add a half cup chicken broth and a handful of fresh herbs (parsley, mint and basil) and blend until smooth. Turn into a pan and simmer on low heat while you prepare pasta. I’ve enjoyed this sauce twice this week — once over quinoa spaghetti noodles and once over mushroom ravioli — it’s so good (and I’m trying to use up my garden harvest). Try it. Do you remember that strange chicken salad that has raisins and almonds, all dressed in curried mayonnaise? Well, if you don’t remember it, you must not be from the Midwest. The recipe for it must have been in the same issue of Good Housekeeping or Better Homes & Gardens as the recipe for Waldorf Salad in the ’60s because I remember some version of these two salads being served by my mother or some other family matriarch at various ladies’ gatherings. A little Google research reveals a version of this curry salad, called Coronation Chicken, was served at the coronation of Queen Elizabeth II in 1953 so maybe it’s less “Midwest” and more “suburban” as I can imagine American women’s magazines popularizing this dish for their readers. This old-timey salad was the inspiration for a healthier version I created to use my fresh raisins (check out that experiment here). Instead of mayonnaise, I channeled a green goddess and substituted plain yogurt and avocado. The result was exotic and fresh tasting — the basil leaves were an inspired addition (thanks, garden, for being a constant source of creativity). Combine dressing ingredients, stirring until smooth. Sprinkle both sides of the chicken breast with curry powder, paprika, salt and pepper, and saute with cooking spray in a saute pan over low to medium heat until no longer pink in the middle. Assemble the remaining salad ingredients on a plate. Drizzle with dressing. 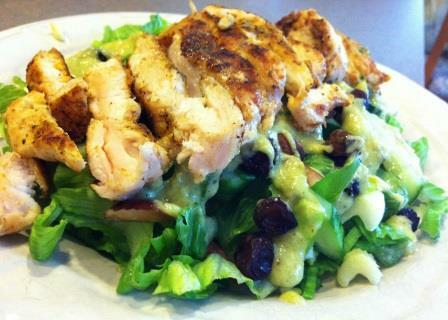 Slice chicken and arrange on top of salad. Enjoy immediately. Serves 1; multiply ingredients for additional salads. By the way, this salad would qualify as lunch in the “Omni Diet,” a little bit outlandish and laborious eating plan I’ve been attempting to follow for the past week. If you’re lactose intolerant, use a couple of tablespoons of coconut milk instead of plain yogurt. I’ll save you the trouble of calculating the calories: 456. This salad is worth the effort. Summertime is the season for ribs, at least it is as Minnesota Transplant’s house. We got a good deal on meaty baby back ribs at Costco, so we indulged tonight and I’m sharing my Beloved world-famous recipe for those of you who might have missed it the first time. Two small changes we tried today: Tyler used a rub on the ribs after boiling them in RC Cola, and then he smoked them on low heat in his smoker grill for about 90 minutes. The rub wasn’t really necessary, but the smoking added lots of flavor. 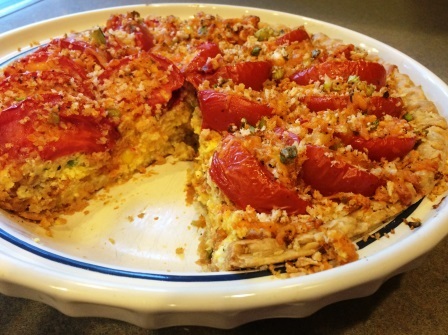 Still, even if you don’t have a smoker, you’ll love this recipe from 2011. Try it. My mother never made barbecued ribs when I was growing up, so when I started cooking for myself and eating out, I never cooked them or ordered them either because I didn’t know they could be good. See, she made a batch for her father-in-law when she was pregnant with me, and they were awful because she didn’t know what she was doing; they made her sick. She never attempted them again, and in fact, found ribs in general to be tough and greasy. In the way things always seem to come full circle, we entertained my parents for dinner tonight, and my husband decided to make ribs for his in-laws. Only the big difference here is that my Beloved knows how to make ribs (and I’m not pregnant). Some pretty purple plums at the market last week spoke to me. “We’d be delicious grilled,” they said. So I picked ’em up and waited for an opportunity to have my Beloved throw them on the grill after he’d made some sort of carnivore’s delight. I only had to wait until today. Caswell, who is learning the art of grilling from his father, set the halved plums on the barbecue grill and proceeded as instructed. I was so looking forward to a sweet dessert! 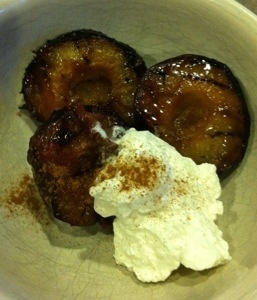 I topped the plums with freshly made whipped cream, and I luxuriated in my first bite. It started out sweet but about three chews in, all I was tasting was burnt wood. And whipped cream. Not a good combination. Grilling lesson: Don’t overcook the stone fruit.